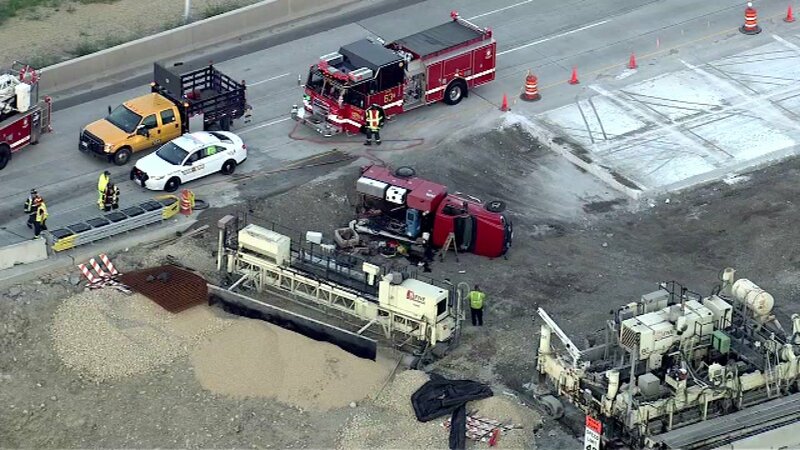 DES PLAINES, Ill. (WLS) -- One person was extricated from a vehicle that was involved in a crash with a construction truck on eastbound I-90 in northwest suburban Des Plaines. The driver of the truck was also hurt. Police said around 5:20 a.m. Wednesday, the vehicle rear-ended the red truck that was pulling into a construction zone on the eastbound Jane Addams Memorial Tollway near Elmhurst Road. The truck ended up on its side next to the road. The driver of the other vehicle was trapped inside. Emergency crews were able to pull that person out by 6 a.m. The person driving the truck was taken to Advocate Lutheran General Hospital with a broken leg, police said. No other injuries were reported. There is no word yet on whether any traffic citations will be issued.